Jean Baptiste Vuillaume is widely recognized as one of the finest 19th century luthiers, leaving an indelible mark on the French tradition and influencing generations of violin makers and dealers throughout the musical world. His career is marked by a relentless drive to construct the perfect instrument, combining the classical Italian tradition with contemporary French style. He had access to one of the largest caches of old Italian instruments, which he studied assiduously to recreate the great masterpieces, at an affordable price. He was so successful in fact that he counted among his many prizes at World’s Fairs and International Exhibitions, the Cross of the Legion of Honor, the highest honor in France. Never satisfied to rest upon his laurels, Vuillaume unceasingly strove for superior quality throughout his career, constructing together with his talented staff of luthiers nearly 3,000 superb instruments. When Vuillaume moved his shop to 3 rue de Ternes in 1858, at the age of 60, his intention was not to retire, but to focus his energies on constructing the finest instruments for concert musicians, collectors, and European nobility. 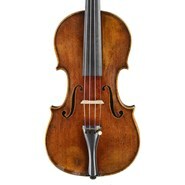 After working in the heart of Paris for 30 years, Vuillaume had fashioned a flourishing business through careful attention to clients of all incomes, brilliant innovations in the craft, and a unique synthesis of contemporary French elegance inspired by the old Italian masterworks of Stradivarius and Guarneri del Gesu. His customers included great musicians like Piatti, Servais, and Paganini, great pedagogues like De Beriot, Savart, and Dancla, and nobility from Spain to Russia. He brought this international fame with him to his new workbench in the outskirts of Paris. He set up his private studio in the attic of his atelier. It was here that he personally finished and varnished all the instruments that were to bear his flamboyant signature. Not satisfied with allowing an instrument of merely competent quality to go forth from his workshop, he guaranteed that the archings would facilitate the silky power desired by Europe’s best musicians, that the scrolls were masterfully conceived and sculpted, that the purfling was perfectly laid- in short that his instruments were up to his highest of standards both tonally and aesthetically. He took particular pains to ensure his unique varnish recipes and application techniques were not copied by competitors. He not only varnished each and every instrument produced in his atelier, legend has it he stuffed his apron with aromatic herbs to cover up the scent of individual ingredients. Made in 1873, this violin is one of the last instruments constructed in Vuillaume’s workshop, and the accompanying sales receipt and certificate show it was last sold by the important Parisian firm of Roger & Max Millant in the 1950’s. The scroll is well balanced, always elegant. The turns on the volutes are harmonious and easy, spiraling fluidly toward a softly rounded eye. The purfling is perfectly set with ebony, gracefully framing the instrument. The one-piece back is of a magnificently flamed piece of maple. The top is of a typically wide-grained piece of dense spruce, ideal for a glowing, soaring sonority. Ever the perfectionist, Vuillaume selected all the wood for its’ aesthetic as well as tonal properties. The instrument is modelled on the work of Guarneri Del Gesu and is dressed in a rich golden red varnish with a soft rose colored hue. Like many Vuillaume violins, this nimble instrument is possessed of a powerful response, giving the player total musical control. The tone is nuanced in color and rich in resonance, perfect for a concert violinist or chamber musician. One of the best makers of his generation, Oddone signed 269 instruments over the course of his career. He began his apprenticeship at a very young age with Rinaldi before working closely for two years with Frederick William Chanot in London. The experience with the Chanot family proved to be the catalyst for his career, as he was influenced by their working techniques and models. After moving back to Turin, his hard work and exacting woodwork earned him a fine reputation as a restorer and luthier. Having already established himself as a preeminent luthier by the 1890s, Oddone established his own shop in 1900. After World War I, Oddone reached his most prolific and stylistically mature period- a period which lasted right up until his death in 1935. Characterized by a meticulous craftsmanship, bold character, and a thick golden-orange hued varnish, this violin exemplifies his most famous working period. This very fresh instrument which in fact still retains the original Oddone bridge, is in exquisite condition and has a clear, brilliant tone. The violin is pictured in Volume IV of "Italian & French Makers" by Jost Thoene. Bisiach was probably the most important figure in Italian violin making of his era. His instruments dating from 1900 and before are considered by experts to be his best. This is an exceptional example of his work, in wonderful condition and a superb tone. It is one of the finest examples by this maker we have ever had. Vincenzo Postiglione has been considered one of the greatest Italian makers of the period. Postiglione likely learned the craft from his father before apprenticing with Vincenzo Jorio. By 1855 he had set up his own shop in his native Naples where he built a fine reputation as luthier, repairman, and curator. He was talented and prolific, building nearly 300 violins and more than 100 cellos, earning himself a reputation as one of his generation's best luthiers. In 1910 he passed his shop on to his sons, retiring after a remarkable 55 year career. This particular violin is a classic example of his work: With dramatic dark orange-red varnish and a striking scroll, it is easy to play, at once responsive and forgiving, and has a clear tone. It is accompanied by a D'Attilli certificate. The second son of violin maker Carlo Carletti, Orfeo worked closely with his older brother, Natale. Though the talented Orfeo died in 1940 at the age of 36, he left behind many instruments of bold character. This violin is a good example of his work, made when he was only 23 years old. Like so many of the finest luthiers, Charles Adolph Gand grew up in a family with a long lineage of important makers. His pedigree can be traced back to Nicolas Lupot of Orleans, arguably France’s most influential maker. After studying with and working for Francois Pique, the first of the French makers working in the “modern” style, Lupot set up in Paris in 1798. His accolades include an appointment to the Imperial Chapel in 1813, luthier to King Louis XVIII in 1816, and a commission as luthier to the Paris Conservatory of Music in 1817, to whom he would make an instrument for the winner of the annual competition. In 1802 he hired Charles Francois Gand, known as Gand Pére, as apprentice. Charles Francois Gand, the father of Charles Adolph Gand, was himself a first rate luthier. Having learned the “modern” style from his master, Gand Pére constructed instruments on the Stradivarius model rather than the Stainer or Amati models. In other words, he preferred instruments with a flatter arching which achieved a powerful sound fit for contemporary concert halls. In 1820 he acquired the shop of another influential Parisian maker, Koliker, building a large atelier of international importance. Though he was considered a rival to the thriving businesss of Vuillaume and Lupot, he maintained a good relationship with Lupot. When Lupot retired in 1824, he passed all his official appointments to Gand Pére. Charles Adolph Gand, also known as Gand Frére, took over his father’s shop in 1845. Steeped in a rich tradition of France’s best luthiers, Gand flourished as one of the finest makers of his generation. Working with his brother Eugene, he won 1st prize at the Paris Exhibition in 1855, receiving the prize directly from Napoleon III, the emperor of France. In 1862 he was made Chevalier de la Légion d’Honneur, the highest honor in France. A source of national pride, he was also the official luthier to the Paris opera and to the Emperor. Because he was an acclaimed expert of old instruments he had limited time to make instruments. Yet his entire production is of the highest quality, and is sought after by collectors and professional musicians alike. This violin is exemplary of his production. All the woodwork is exquisite and elegant, the varnish a rich red with a touch of antiquing. The tone is clear and fresh with plenty of power. It is in exceptional condition and would be fit for a collector or professional musician. Musicians from all over the World flocked to Bisiach’s shop. At the time it was one of the most important shops anywhere. The quality of the instruments produced there were the very best. This is an outstanding example with a responsive tone with depth and character. 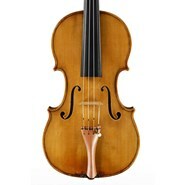 Marchetti is generally regarded as the best Turin violin maker of the 20th Century. He won awards at many European competitions and established a very successful business. He trained with Bajoni and Rossi in Milan and then with Antonio Guadagnini before setting up his own shop in 1881. This is a fine example of this master's work. Joseph Hel trained with Sebastien Vuillaume, Salzard and Darche before setting up on his own in Lille at the age of 23. He was appointed official luthier to the Lille Conservatory, a post he passed on to his son. He also won several prizes in international exhibitions, including in the United States. He was surprisingly prolific, making by some accounts, over 800 instruments of superior quality. This is one of the last instruments he made and is characteristically attractive, clear and sonorous. Born into a woodworking family in 1879, it was not until Pedrazzini was in his mid-twenties, that he moved to Milan and began violin making. Originally self-taught, he worked with Romeo Antoniazzi before setting up his own workshop. A maker of exceptional skill, Pedrazzini won several prizes, including gold in The National Violin Making Competition in Rome, 1920. Among his posts, he was the luthier to the prestigious Milan Conservatory and supplier to the Toscanini Orchestra. He also taught Ferdinando Garimberti, among others. This violin is a Guadagnini copy, but rather than a slavish copy, is inspired by Guadagnini. The varnish has been generously applied and, typical of his early instruments, has a beautiful craquelure. The tone is crisp, clear, and sweet. Born into a woodworking family in 1879, it was not until Pedrazzini was in his mid-twenties, when he moved to Milan, that he began violin making. Originally self taught, he worked with Romeo Antoniazzi before setting up his own workshop. A maker of exceptional skill, Pedrazzini won several prizes, including gold in The National Violin Making Competition in Rome, 1920. Among his posts, he was the luthier to the prestigious Milan Conservatory and supplier to the Toscanini Orchestra. He also taught Ferdinando Garimberti, among others. This violin is branded internally, and is a characteristic example of his later work. It is easy to play and has a typical 20th century Italian sound. A remarkable luthier with a prolific career, Rodolfo Fredi was born a count and studied with his father. After studying at the Rome conservatory, he set up his own workshop where he quickly gained renown as a talented repairman in addition to being a fine luthier. He won several awards at competitions including Turin, 1911, and Rome, 1917. This violin is one of the last instruments he made. It is very easy to play and has a sweet, strong tone. We are pleased to offer this superb violin by Paul Blanchard of Lyon, one of the great 19th century violin makers. Born in Mirecourt, the cradle of French violin making, he began his studies at the age of 15. He subsequently trained with and worked for some of France’s most prominent luthiers, including Darte and Silvestre. At the fresh age of 19 he established his own shop in Lyon, where he had a long and storied career. The most prominent instrument maker in Lyon during his lifetime, he was appointed official luthier to the Lyon Conservatory, the Lyon theaters, and the Lyon orchestra. Made at the height of his ability, this violin is of luminous tonewood dressed in a rich red varnish. It has a vibrant tone and is in excellent condition. It is accompanied by a Moennig certificate. After studying with Galliard, Paul Bailly worked with the great J.B.Vuillaume in Paris. He then worked in other major cities in France, Belgium, England and even in the U.S. He won numerous medals at important competitions. After his travels, he settled in Paris where he had a successful career. His work is esteemed and highly sought after. This beautiful violin would be a great choice for the musician looking for an instrument with a full, warm tone with great richness. In his early years, Cortese was strongly influenced by the great Cesare Candi. He worked in both Milan and Genoa, winning medals at exhibitions in Rome (1952) and Cremona (1949). His primary focus was on tonality. We are especially pleased to be able to offer these two superb examples of the work of Emile Germain. Born in 1853, Emile trained first in Mirecourt (as did almost all Parisian makers) and then with his father in Paris. He took over his business in 1870 and continues on until 1933. He won a medal at the Paris Exposition Universelle in 1900. These two wonderful violins are in unusually fine condition made from the very finest materials. Résuche worked for famous shops both in Paris (Gand & Bernardel) and Lyon (Diter) before establishing his own shop in Bordeaux. 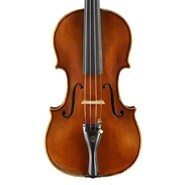 This beautifully made violin has a full, rich tone. Gennaro De Luccia came from a large family of violin makers that spanned three generations. He came to America in 1951 and worked at the famous Rembert Wurlitzer shop along with his brother Vincenzo plus some of the best makers of the mid 20th. century. This violin was dedicated to St. Francis of Assisi, according to the maker’s internal inscription. Ada Quaranta’s instrument are in great demand because of their great quality. She studied at the Cremona school beginning in 1990 after receiving her diploma in violin performance. After graduation, she worked in some of the most important shops in Germany and France. She has won numerous awards for her work. We are pleased to be able to offer this fine example of her work. Cavalazzi was a student of Domenico Veggi and established his workshop in the late 1920’s. A highly respected maker, he also did extensive research in varnish chemistry. This violin has a full, warm tone of great quality. Magrini has become one of the most important makers of the Bologna school and this violin displays the best of the elegance and craftsmanship of the Bologna makers. 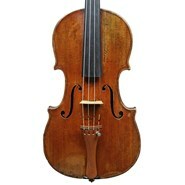 This violin is a reproduction of a violin by Ansaldo Poggi.